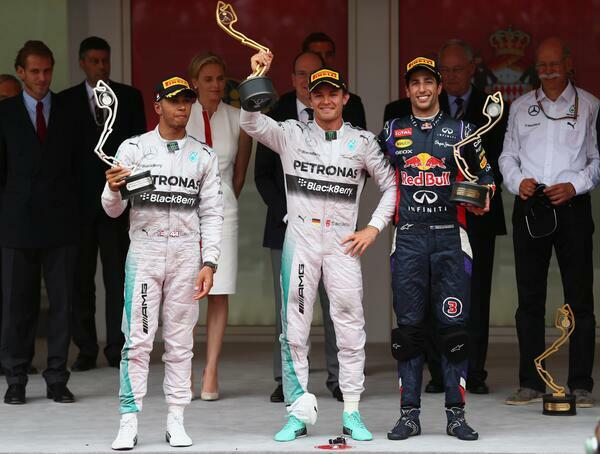 Home » Formula One: Rosberg holds off heated Hamilton for Monaco win! 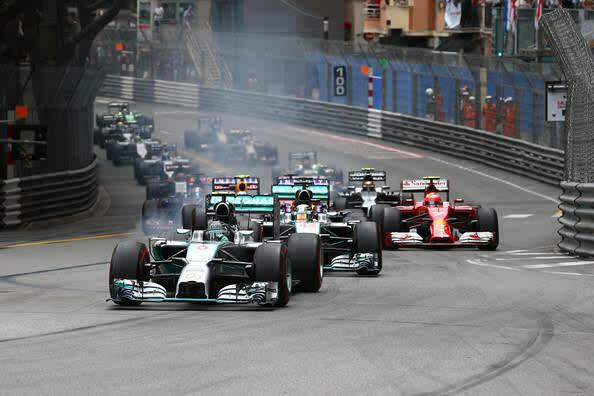 Nico Rosberg has won the Monaco Grand Prix after holding off team-mate Lewis Hamilton to lead every lap of the race. Hamilton had stayed within 3 seconds of his team-mate for a majority of the race before falling back after getting dirt in his eye. He managed to claw onto 2nd ahead of a charging Daniel Ricciardo who was on Hamilton’s gearbox as the pair crossed the line. Another headline from the principality is that Marussia F1 Team managed to secure their first ever points in Formula One after Jules Bianchi finished in 9th place. This may have been aided by many retirements in the race, including Sebastian Vettel, but the Marussia team must still be credited for building a car that out-lasted 12 others to secure a vital 2 points. Rosberg nailed his start as the lights went out and he kept the lead over Hamilton into turn 1; no chance for a Senna-esque as Lewis may have hinted. Ricciardo on the other hand bogged down, allowing Vettel to draw alongside and get past. Alonso tried to capitalise on a good start but was caught up by the side-by-side Red Bulls. The delay meant that team-mate Raikkonen was able to swoop around the outside and move into 4th. The start didn’t go well for Force India’s Sergio Perez. Ex team-mate Jenson Button made a move down the inside into Mirabeau, with Perez turning in too much and tagging the front of the McLaren. The contact put Perez into the barrier and in turn, bought out the Safety Car. Swift work by the Monaco mechanics meant that the race was restarted at the end of lap 3. Rosberg pulled the pin on the restart and bolted away, but Hamilton kept close to remain on terms with his team-mate. Sebastian Vettel couldn’t keep up with them in 3rd however. It soon became apparent that Sebastian had a problem as he fell through the order and was down in 20th as he entered the pits. The team sent him back out once more, but more problems led to his retirement; a crushing blow to his season which tears any small hope of a 5th consecutive world championship to shreds. Adrian Sutil may have been knocked out of qualifying in the first session yesterday, but that wasn’t going to be the end of his weekend. He had a fantastic race last season when he made several bold overtakes in the Lowes hairpin, experience that he was going to use again. A ‘kerb-crawling’ move up the inside of Grosjean at the hairpin secured 17th, followed by another move in the same place on Marcus Ericsson for 16th. The German wasn’t finished as he made a move on Max Chilton for 15th into the chicane. Back up front, the advantage between the two Mercedes drivers was swinging between them. Rosberg would pull away by a few tenths, only for Hamilton to come right back at him. On lap 25, the two Mercedes cars exited the tunnel to find debris all over the circuit at the chicane. It was Adrian Sutil’s Sauber which had gotten away from him over the bump which caught out Kvyat in qualifying. The Sauber had hit the inside barrier and spread debris all over the track and the run-off area before coming to rest just off of the track. The Safety Car didn’t come out at first, with both Mercedes cars remaining on track. Lewis wanted to pit, but was refused entry by the team. Then the Safety Car was deployed, which meant that Mercedes had to pit both cars on the same lap. With all the drivers electing to make only 1 stop in the race, it was vital that the pit-stops went well. Lewis managed to back off enough to allow a successful double-stop for the Silver Arrows, but was massively annoyed that the team hadn’t let him pit the lap before. Despite the high number of cars on pit-road, there were no calamities apart from a near-miss for Jean-Eric Vergne when he was released into the path of Kevin Magnussen; earning the Toro Rosso driver a drive through penalty. Kimi Raikkonen had made an excellent start to his race and was continuing to run in 3rd after making his pit. However, as the drivers started their last lap under Safety Car, the Finn had to pit again, dropping him down to 13th and ruining his race. Former team-mate Felipe Massa didn’t pit under the Safety Car and was up to 5th thanks to his unusual strategy. Rosberg got away well on the restart, with Hamilton staying with him once again. Ricciardo made a reasonable start from 3rd but couldn’t keep pace with the two Mercedes. Nico Hulkenburg was behind Magnussen’s McLaren on the restart, but he wasn’t planning on staying there for long. The Force India driver made a fantastic, unexpected move up the inside at Portier for 7th place. Hulkenburg wasn’t the only driver on the move. Under the watchful eyes and support of Touring Car stars Gordon Shedden and Matt Neal, Jules Bianchi made a ‘Touring Car’ style pass as he traded paint with rival Kobayashi in the Caterham for 13th place. The battle was continuing to intensify for the win. Rosberg was starting to slow down after being told that he had to save fuel. Hamilton kept within 2 seconds of his team-mate but could not find a way through. There were two occasions where a Safety Car threatened to make an appearance. The first was when Valtteri Bottas came to a stop at the Lowes Hairpin with an engine failure, but expert work but the car removal cranes saw the Yellow flags bought back in a few laps later. The flags were back out a few laps later when Esteban Gutierrez hit the wall on the inside of Rascasse, spinning the Sauber round with a puncture. Once again, the Marshalls were able to push the car out of the way without any issue. With just over 10 laps to go, it looked as though the battle between the Silver Arrows wouldn’t relent until the race was over. Suddenly, the battle was over. Hamilton went from just over a second down to over 4 seconds off. Lewis reported that he had something in his left eye and couldn’t see out of it. He asked to be kept up to date with the gaps to Nico and said that he didn’t care about where Ricciardo was in 3rd. However, he soon took note as Ricciardo started to reel him in. With just a few more laps to go, Ricciardo closed on to the back of Hamilton, with the Australian just half a second behind as the final lap begun. Although Ricciardo was much faster, the old saying of “catching up is one thing, but passing is another” proved true, with Ricciardo having to settle for third on the rostrum. 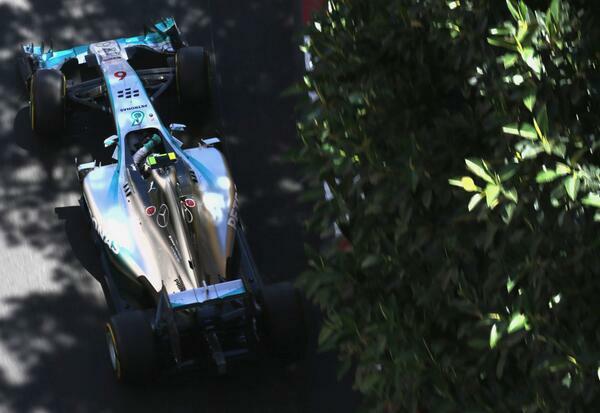 With Hamilton’s eye problems hampering his performance, Rosberg was able to pull out a lead of over 6 seconds and crossed the line to win his 2nd consecutive race in the Monaco Grand Prix. The talking point of the weekend may be the ignition of the rivalry between himself and his team-mate, but there is no denying that Rosberg drove a perfect race to lead every lap from his controversial pole position. Hamilton edged out Ricciardo to take the team’s 5th 1-2 finish in a row, with Ricciardo taking his 2nd official podium of his career. The tension between the Mercedes duo showed no signs of wavering as the pair prepared for the podium. Neither driver acknowledged the other before, during or after the ceremony, with Lewis making a speedy exit as soon as the interviews, conducted by Sherlock actor and part-time dragon Benedict Cumberbatch, were over. Fernando Alonso drove a relatively undramatic race to take 4th ahead of another brilliant effort from Nico Hulkenburg in 5th for Force India. Jenson Button came home in a strong 6th after missing out on the top 10 in qualifying. Felipe Massa’s unique strategy saw him claim 7th after starting 16th; an impressive gain after making his tyres last over 40 laps on the streets on Monte Carlo. Romain Grosjean managed to go from 14th to 8th during the race to secure a second top 10 finish for Lotus this year. 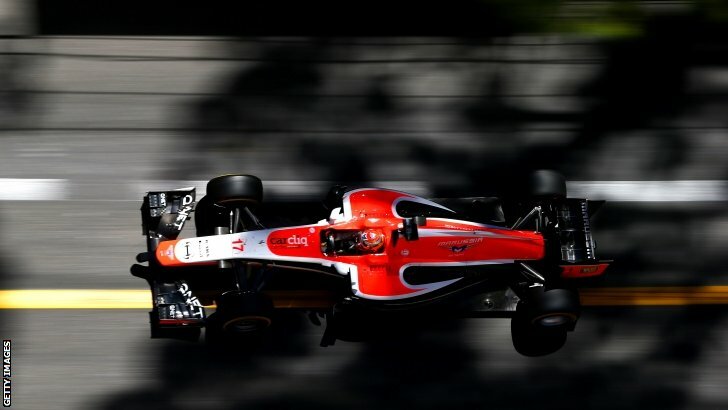 One of the most memorable stories of this weekend’s Monaco Grand Prix has to be the fantastic effort by Jules Bianchi and the Marussia team. Despite gaining a penalty for not lining up in the correct grid position, serving the penalty incorrectly under the safety car and earning a 5 second penalty to be added after the race, Bianchi managed to do what Marussia have been trying to do since they made their debut in 2010. Bianchi prevailed through all of the drama to take Marussia’s first ever points in Formula One as Jules crossed the line to finish 8th, but ended up 9th after the addition of his penalty. The two points are vital for the small Marussia team who have come so close in the past, but have now achieved their long term goal. Kevin Magnussen had been running further up in the top 10 in the closing stages, but after an audacious move up the inside by Kimi Raikkonen, the pair became wedged on the outside of the Lowes hairpin. They both managed to get underway again, with Kevin claiming a point for 10th place and Kimi settling for 12th; the pair separated by Ericsson, who almost claimed a point for Caterham. Kamui Kobayashi and Max Chilton were the last two classified finishers of the race in 13th and 14th for Caterham and Marussia. The late retirements from Gutierrez and Bottas put them down to 15th and 16th. Toro Rosso had a miserable race after their impressive double top 10 grid position with both cars developing engine issues. The Italian team were undoubtedly disappointed with 17th for Vergne and 19th for Kvyat. The pair were split by Sutil who, as mentioned previously, retired after an altercation with the barrier after a hard charging start in the Sauber. Sebastian Vettel and Sergio Perez were the last two classified finishers after their early retirements.